Aim: Periodontitis and diabetes mellitus share a bidirectional relationship. Resistin is an adipocytokine shown to be associated with type 2 diabetes mellitus. Hence, the present study aims to estimate the effect of non-surgical periodontal therapy (NSPT) on GCF resistin levels in healthy individuals with gingivitis and well controlled diabetics with periodontitis, and correlate the same with HbA1c levels of the diabetic subjects. Materials and Methods: The present study was a comparative interventional trial set in Department of Periodontics, the Oxford Dental College, Bangalore. Forty subjects participated in the study and were divided into two groups; group I (healthy individuals with gingivitis) and group II (diabetic individuals with mild to moderate periodontitis). Periodontal parameters were assessed and GCF was collected and analysed for resistin before and 3 months after NSPT. Statistical Analysis: All the analysis was done using SPSS version 18. A P value of < 0.05 was considered statistically significant. Results: A significant difference was observed in GCF resistin concentrations between the two groups at baseline, wherein group II had significantly higher values. Following NSPT, there was a significant reduction in GCF resistin concentrations in both the groups, however intergroup comparison showed no difference in the amount of reduction. When all samples were analysed together, no significant correlation could be found between resistin and the parameters assessed. Conclusion: Resistin levels are increased in diabetes related periodontitis. However, post treatment a similar response can be seen between healthy and well controlled diabetics. Hence, resistin can be used as an inflammatory biomarker for diabetes related periodontal disease. Periodontal disease and Diabetes Mellitus (DM) are the two most prevalent conditions worldwide today. Both of these conditions are complex chronic diseases with an established bidirectional relationship. Chronic inflammatory periodontal disease represents a primarily gram negative oral infection that leads to gingival inflammation, destruction of periodontal tissues, loss of alveolar bone and eventual exfoliation of teeth in severe cases. It is caused by the interaction of bacterial plaque and the host, which thereby results in destruction of the supporting alveolar bone and connective tissue. Although bacterial plaque has been implicated as the primary etiologic agent in most forms of periodontal disease, there are local and systemic factors which may modify both microbial and host components. Local factors may favour plaque accumulation and maturation, while systemic factors may modulate and decrease the host's protective response. DM is emerging as a global epidemic and is used to describe a group of metabolic disorders distinguished by altered glucose tolerance and impaired carbohydrate metabolism. It has been regarded as a major risk factor for periodontal disease, and influences the progression of the disease. The interrelationship between diabetes and periodontitis provides an example of systemic disease predisposing to oral infection, and once the infection is established, the oral infection exacerbates systemic disease. However, given the ubiquity of periodontal diseases and the emerging global diabetes epidemic, the complications of which contribute to significant morbidity and premature mortality, further research of this bidirectional relationship is mandatory. Resistin is a newly discovered adipocyte hormone, named after its proposed function of resisting insulin. Initially resistin was thought to be produced by adipocytes alone; however, emerging evidence suggests that it is also produced in abundance by various cells of the immunoinflammatory system, indicating its role in various chronic inflammatory diseases, thereby acting as a pro inflammatory cytokine. Elevated levels of resistin found in diabetes mellitus highlights its impact on the glycaemic status of an individual. With the advancements in the technologies for the early detection, intervention, and prompt treatment of diseases, there is a growing scope for finding the most specific and sensitive biomarker, resistin being one such newly recognized marker. The role of resistin in periodontal disease and diabetes mellitus has been previously evaluated, however the effect of NSPT on its levels has not been considered yet. Hence this study was intended to determine the levels of resistin in initial and advanced type of periodontal disease and also to determine the effect of NSPT on its levels. The study protocol was approved by the ethical committee of The Oxford Dental College and hospital, Bangalore. 40 subjects who visited the department of periodontics, The Oxford Dental College and Hospital, Bangalore, were recruited in the study. The subjects were divided into two groups. Group I consisted of 20 systemically healthy subjects with Gingivitis and Group II consisted of 20 well controlled diabetic subjects with mild to moderate chronic periodontitis. Subjects in both the groups underwent non-surgical periodontal therapy. GCF sample was collected from all the patients at baseline and at 3 months following non-surgical periodontal therapy. Patients with any systemic disorders or medically compromised patients, pregnant or lactating mothers, patients who had received any medications such as anti-inflammatory drugs, antibiotics, corticosteroids or any form of periodontal therapy within last 6 months were excluded from the study. Diabetic patients who are taking medications like rosiglitazone and piaglitazone were also excluded from the study. Clinical parameters were recorded one day prior to GCF sample collection, and the same was repeated post treatment after 3 months. GCF sample collection was done one day after recording clinical parameters to avoid stimulation of the sample and its contamination with blood. Each site selected for GCF sampling was isolated with cotton rolls. GCF sample collection (4μl) was done by extra-sulcular method using calibrated microcapillary pipettes of length 125mm and bore size of 0.01mm. Pooled GCF samples were collected before and after non-surgical periodontal therapy. Detection and calculation of resistin in GCF was based on the principle of ELISA. Standards, Quality Controls and samples were incubated in microplate wells pre-coated with polyclonal anti-human resistin antibody. After 60 minutes incubation and washing, biotin labelled second polyclonal anti-human resistin antibody was added and incubated with captured resistin for 60 minutes. After another washing, streptavidin-HRP conjugate was added. After 60 minutes incubation and the last washing step, the remaining conjugate was allowed to react with the substrate solution (TMB). The reaction was stopped by addition of acidic solution and absorbance of the resulting yellow product was measured. The absorbance is proportional to the concentration of resistin. A standard curve was constructed by plotting absorbance values against concentrations of Standards, and concentrations of the GCF samples were determined using this standard curve. The sample size was calculated based on data from previous studies. Independent t-test was used to determine the inter group comparison for the various clinical parameters, whereas paired t-test was used to determine the results of these variables within the same group, i.e difference in the GCF resistin scores and HbA1c values at baseline and follow up for each group. Pearson correlation was used to quantify the correlation between the GCF resistin levels and the clinical parameters amongst both the groups. 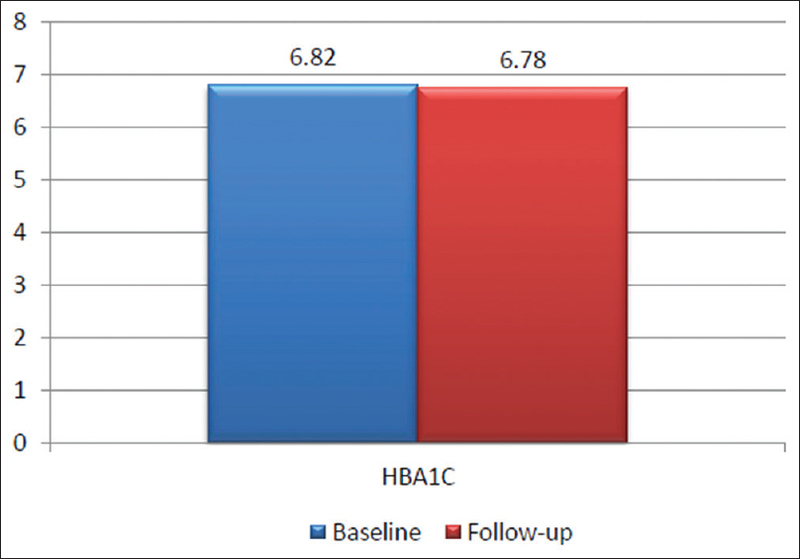 The mean HbA1c score for group II at baseline and post treatment was 6.82 ± 0.20 and 6.78 ± 0.20 respectively. 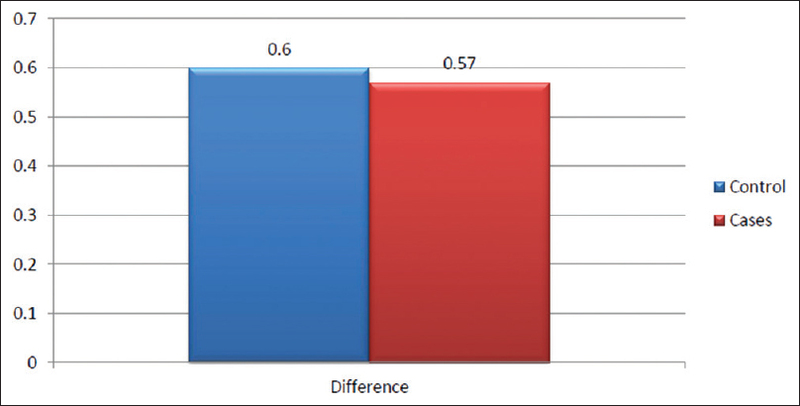 The mean difference was statistically significant (P value 0.007) [Figure 1]. The mean GCF resistin score for group I at baseline and posttreatment was 1.96 ± 0.67 and 1.36 ± 0.62 respectively. The mean difference was statistically highly significant (P value < 0.001) [Figure 2]. The mean GCF resistin score for group II at baseline and posttreatment was 2.50 ± 0.25 and 1.93 ± 0.22. The mean difference was statistically highly significant (P value < 0.001) [Figure 3]. There was no statistically significant difference in the mean reduction in the resistin values before and following treatment between the two groups (P value 0.82) [Figure 4]. There was no significant correlation between resistin and other clinical parameters in both the groups at baseline and follow up [Table 1]. Adipokines include several cytokines, chemokines, and hormone-like factors that participate in the regulation of physiological and pathological processes such as metabolism, immunity, and inflammation. Resistin is one such adipokine which is expressed mainly by the monocytes and macrophages and has an impact as an inflammatogenic cytokine. Studies evaluating the role of resistin in the inflammatory process reveal that it exhibits potent proinflammatory properties, suggesting a role for this cytokine in linking periodontal disease and diabetes. The effect of NSPT has been extensively studied in diabetics, to see its impact on the glycaemic control and inflammatory status. Literature provides evidence that mechanical periodontal therapy associates with approximately a 0.4% reduction in HbA1c at 3 months, thereby improving the metabolic control of diabetic individuals. Also, levels of pro-inflammatory cytokines have shown to reduce following NSPT and the same can be confirmed from a study conducted by Navarro-Sanchez et al. which indicates that NSPT results in marked decrease of inflammatory markers. To the best of our knowledge, till now no study has exclusively checked the effect of NSPT on GCF resistin levels in gingivitis and compared it with chronic periodontitis patients with T2DM. Hence, this study was undertaken to see the effect of NSPT on GCF resistin levels in diabetic patients with chronic periodontitis, and compare it with healthy individuals with gingivitis. In the present study, there was a statistically highly significant reduction in the plaque index, gingival index, probing depth and clinical attachment loss scores following NSPT in both the groups. Similar findings were noted in studies carried out by Cobb, Darby et al.,, This reduction can be attributed to removal of local factors, better oral hygiene maintenance and compliance with the treatment protocol. Following NSPT, the mean HbA1c value reduced to 6.78 ± 0.20. This difference was statistically significant, and is similar to findings reported by Hungund and Panseriya, Moeintaghavi et al., Kiran et al.,,, whereas were contradictory to the findings reported by Jones et al. This reduction in the HbA1c values indicates that NSPT positively affects the glycaemic control in well controlled diabetics and could be attributed to the fact that reduction in the levels of pro-inflammatory cytokines, mainly the expression of TNF ά post treatment simultaneously reduced the insulin resistance as well. To the best of our knowledge, no study has yet detected and confirmed presence of resistin in chronic generalised gingivitis, which is the initial form of periodontal disease. The present study is the first of its kind to do so and found the concentration to be 1.96 ± 0.25 ng/ml. The mean value of resistin at baseline for group I and II was 1.96 ± 0.67 and 2.50 ± 0.25 respectively. Group II had a significantly higher mean resistin score as compared to group I. These results were comparable to the ones by Hiroshima et al., wherein the mean value of resistin seen in diabetes related periodontitis was 2.01 ± 3.10 ng. Increased counts of monocytes and macrophages in periodontitis which express higher concentration of resistin, could be held responsible for the increased value of resistin in group II. Another reason for this increased value could be that P gingivalis, being a keystone pathogen in periodontitis could stimulate release of resistin from neutrophils via LPS. This finding was consistent with that of Hiroshima et al. Nevertheless, resistin's action on provoking insulin resistance confirms its raised concentration in diabetic individuals, which could signify an association of resistin with a hyperglycaemic state, as noted in the study carried out by Gokhale et al. 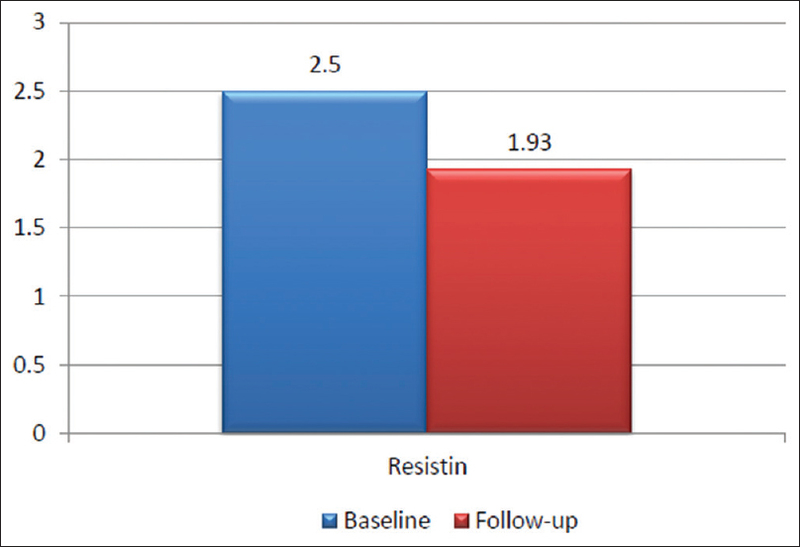 Following NSPT, mean values for resistin at follow up for group I and II was 1.36 ± 0.62 and 1.93 ± 0.22 respectively. 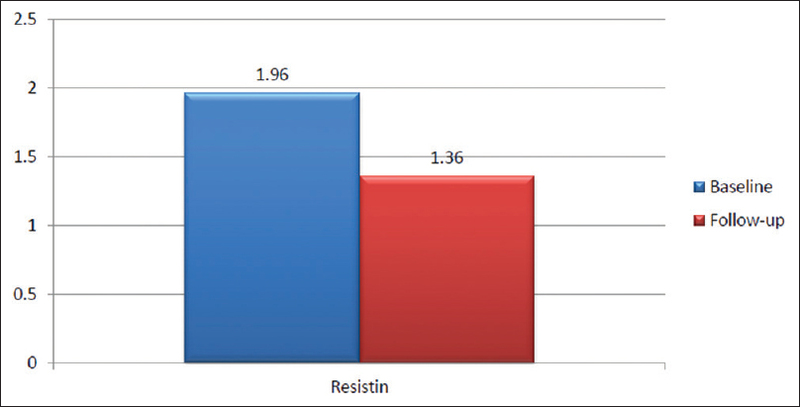 This reduction in the concentration of resistin post treatment was statistically significant. This result signified that NSPT had an influence on both the glycaemic control as well as the resistin levels in subjects in group II. This reduction can be attributed to various reasons. Firstly, with reduction in the periodontal pathogens as a result of scaling and root planing, there is downregulation of P. gingivalis stimulated LPS, thereby reducing the expression of resistin simultaneously. Also, reduction in the inflammatory state resulted in reduction in the levels of pro-inflammatory cytokines, resistin being no exception. We would like to highlight the fact that reduction in resistin post treatment could also have an impact on the improvement in glycaemic status, due to its proved action on the insulin resistance. When the difference in resistin values before and following NSPT for both the groups was compared, the difference was found to be non-significant (0.6 and 0.57 for group I and II respectively). The similar amount of reduction could be due to the fact that the cytokine profile is similar in both healthy individuals and well controlled diabetics, as confirmed in a review by Javed et al. Hence, no disparity in the amount of reduced resistin could be seen. This could signify that resistin is more related to inflammation rather than glycaemic control, and it decreased in a similar manner irrespective of the diabetic status of the individual. A possible limitation of the present study could be that BMI of the individuals was not considered, as resistin has a major role to play in obesity and there could be altered results possible. Also, exclusion of poorly controlled diabetics could undermine the role of glycaemic control on levels of resistin. Future studies with longer follow up period and larger sample size are required to evaluate the long term effects of NSPT on GCF resistin levels. Considering the limitations, the present study concludes that the levels of resistin in individuals with diabetes related periodontitis was significantly higher when compared to those of healthy subjects with gingivitis. On evaluating the levels of GCF resistin following response to NSPT in both the groups, the results demonstrated that, post treatment there was a significant reduction in the values of resistin. However, when an intergroup comparison was done, the difference in reduction of resistin was not found to be statistically significant. This could further validate the relationship between periodontal disease and DM by linking the two conditions via an inflammatory pathway, and suggesting the role of resistin as a biomarker for diabetes related periodontal disease. Based on the findings of the present study which aimed at evaluating the effect of periodontal therapy on resistin levels in diabetics and healthy controls, it could be concluded that resistin has a role to play as an inflammatory marker in periodontal disease. GCF resistin concentration was found to be significantly higher in diabetic individuals with periodontitis as compared to healthy subjects with gingivitis at baseline. There was no correlation found between HbA1c value and GCF resistin concentration, signifying the fact that increased resistin is more so related to the inflammatory condition rather than the glycaemic state of the individual. All authors have contributed significantly in the present study, and are in agreement with the content of the manuscript. In keeping with the latest guidelines of the International Committee of Medical Journal Editors in mind, and I hereby acknowledge them for their guidance and support in completion of the study. Socransky SS, Haffajee AD, Cugini MA, Smith C, Kent RL Jr. Microbial complexes in subgingival plaque. J Clin Periodontol 1998;25:134-44. Parameter on chronic periodontitis with slight to moderate loss of periodontal support. American academy of periodontology. J Periodontol 2000;71:853-5. Caton JG, Quiñones CR. Etiology of periodontal diseases. Curr Opin Dent 1991;1:17-28. Preshaw PM, Foster N, Taylor JJ. Cross-susceptibility between periodontal disease and type 2 diabetes mellitus: An immunobiological perspective. Periodontol 2000 2007;45:138-57. Soskolne WA, Klinger A. The relationship between periodontal diseases and diabetes: An overview. Ann Periodontol 2001;6:91-8. Matu NK, Stephen L, Lalloo R. Prevalence and severity of periodontal disease: Type 2 diabetics versus non-diabetics. SADJ 2009;64:64, 66-8. Engebretson S, Kocher T. Evidence that periodontal treatment improves diabetes outcomes: A systematic review and meta-analysis. J Clin Periodontol 2013;40 Suppl 14:S153-63. Navarro-Sanchez AB, Faria-Almeida R, Bascones-Martinez A. Effect of non-surgical periodontal therapy on clinical and immunological response and glycaemic control in type 2 diabetic patients with moderate periodontitis. J Clin Periodontol 2007;34:835-43. Cobb CM. Clinical significance of non-surgical periodontal therapy: An evidence-based perspective of scaling and root planing. J Clin Periodontol 2002;29 Suppl 2:6-16. Darby IB, Hodge PJ, Riggio MP, Kinane DF. Clinical and microbiological effect of scaling and root planing in smoker and non-smoker chronic and aggressive periodontitis patients. J Clin Periodontol 2005;32:200-6. Hungund S, Panseriya BJ. Reduction in hbA1c levels following non-surgical periodontal therapy in type-2 diabetic patients with chronic generalized periodontitis: A periodontist's role. J Indian Soc Periodontol 2012;16:16-21. Moeintaghavi A, Arab HR, Bozorgnia Y, Kianoush K, Alizadeh M. Non-surgical periodontal therapy affects metabolic control in diabetics: A randomized controlled clinical trial. Aust Dent J 2012;57:31-7. Kiran M, Arpak N, Unsal E, Erdoǧan MF. The effect of improved periodontal health on metabolic control in type 2 diabetes mellitus. J Clin Periodontol 2005;32:266-72. Jones JA, Miller DR, Wehler CJ, Rich SE, Krall-Kaye EA, McCoy LC, et al. Does periodontal care improve glycemic control? The department of veterans affairs dental diabetes study. J Clin Periodontol 2007;34:46-52. Hiroshima Y, Bando M, Inagaki Y, Mihara C, Kataoka M, Murata H, et al. Resistin in gingival crevicular fluid and induction of resistin release by porphyromonas gingivalis lipopolysaccharide in human neutrophils. J Periodontal Res 2012;47:554-62. Gokhale NH, Acharya AB, Patil VS, Trivedi DJ, Setty S, Thakur SL, et al. Resistin levels in gingival crevicular fluid of patients with chronic periodontitis and type 2 diabetes mellitus. J Periodontol 2014;85:610-7.